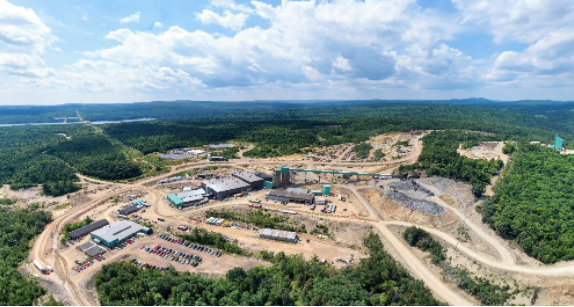 Trevali Mining Corporation (TSX:TV) is a primary zinc producer with four mines across the American and African continents: the Santander mine in Peru, the Caribou mine in New Brunswick, Canada, the Rosh Pinah mine in Namibia and the Perkoa mine in Burkina Faso. In 2018, Trevali is working in a consolidated zinc production guidance of 400-427 million payable pounds, 44-46 million payable pounds by-product lead and 1.4-1.5 million payable ounces of silver, with operating costs of US$60-$66 per tonne or US$0.67-$0.73 per pound of zinc cash cost (net of by-products). The company is also supported by a strong financial profile, the highlights of which are found below. Note: Base case assumes spot zinc price of $1.43/lb. 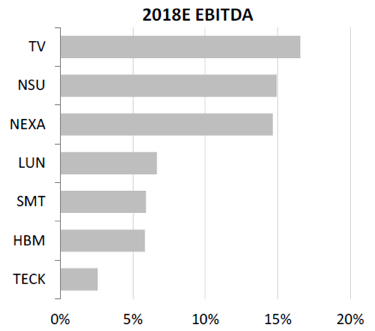 Source: Scotiabank GBM estimates – December 2017. *EBITDA (earnings before interest, taxes, depreciation and amortization) is calculated by considering Company’s earnings before interest payments, tax, depreciation and amortization are subtracted for any final accounting of its income and expenses. The EBITDA of a business gives an indication of its current operational profitability and is a NON-IFRS measure. 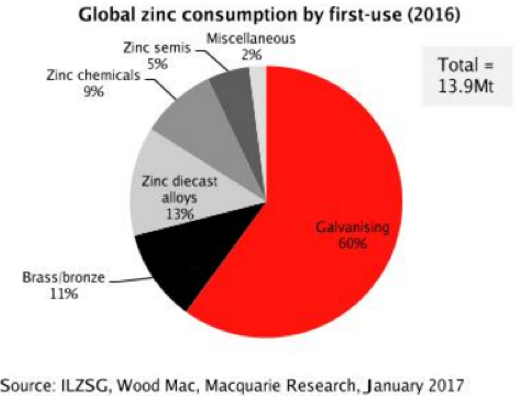 The global zinc demand continues to rise (from between 2-4 percent per year, approx. 280,000-560,000 tonnes/year) – driven by GDP growth, urbanization & infrastructure development, and as a “mid-cycle” commodity with expanding markets for consumer goods (automobiles, appliances, etc.). Mine closures and production cuts are constraining primary supply and driving the zinc price to near-decade highs. There is a consensus forecast of further strengthening zinc prices in reaction to continued supply deficits. Additionally, zinc smelters are scaling back/curtailing refined zinc metal production due to concentrate shortages. Benchmark zinc smelter treatment charges dropped to US$172/tonne in 2017, with no smelter price participation (0 percent escalators), a 10-year low. Forecasts for 2018 are even lower. Approximately 14 million tonnes of zinc is produced and consumed annually. 60 percent of this is utilized for its corrosion resistance (galvanized steel, rebar, autos, structural steel) and the remainder is mostly used in die-casting, production of brass and bronze, and into oxides and chemicals. Developing and emerging economies are anticipated to increase zinc usage as their middle classes expand. By its anti-corrosion nature, zinc acts as a “sacrificial” metal and has one of the lowest rates of recycling of all the base metals. It is difficult to substitute and typically forms a minor cost component in its applications. 30 years of mine operations experience in Canada and Peru. Bryant commenced his career with Mount Isa Mines Ltd at Ernest Henry Mine (Cu-Au), then transitioned to Xstrata Zinc and ultimately Glencore at the world-class Mt Isa Zinc operations. He became GM at the Caribou Mine in early 2016. Gerbrand joined Trevali in 2017 and most recently served as Trevali’s Senior Vice President – Business Initiatives/Development. He is both a Chartered Accountant from the Institute of Chartered Accountants of South Africa and a Chartered Professional Accountant in British Columbia (CPABC) and has over 18 years of experience in various senior management roles in the mining industry. He commenced his career with Deloitte in South Africa, after which he joined Metorex Limited, a listed mining company as Group Financial Controller in 2004. He assumed increasing levels of responsibility over time, including involvement in numerous green and brownfield projects through commissioning and into operational readiness. In 2013, Gerbrand was appointed as Chief Financial Officer of Rosh Pinah Zinc Corporation and was instrumental in the turn-around and modernization of the operation, with a focus on establishing a continuous improvement culture. Over 24 years of international experience in exploration and underground mining, and has held senior management roles with Rio Tinto and Anglo American (including project manager at Anglo’s Michiquillay porphyry Cu-Au-Mo deposit in Peru). Over 25 years of geology/mining industry and research/finance market experience. Steve has held a senior management role with a leading mining research and investment publication and has consulted to resource-focused investment funds. *Disclaimer: The profile provides information which was sourced and approved by Trevali Mining Corporation in order to help investors learn more about the company. Trevali Mining Corporation is a client of the Investing News Network (INN). The company’s campaign fees pay for INN to create and update this profile page, to which links are placed on Investingnews.com and channel newsletters. By completing this form, you are giving consent to receive communication from Trevali Mining Corp using the contact information you provide. And remember you can unsubscribe at any time.